On the third weekend in October, 59 new members were welcomed into the Federal Association of the Order of Malta. Once again, several of the Investiture activities occurred at the historic Mayflower Hotel and St. Matthew’s Cathedral in Washington, DC. Events commenced Friday with the annual members meeting and luncheon, where H.E. János Count Esterházy de Galántha, Order of Malta Official Receiver of the Common Treasure, spoke and conveyed greetings from the Grand Master, Fra' Giacomo Dalla Torre del Tempio di Sanguinetto. New members of the Federal Association board officers were announced and reports were also presented on the various hospitaller regions. In addition, association President Margaret Melady, DM, shared her report, and was recognized for her accomplishments and contributions during her term in office. Later that afternoon, the Rev. Robert J. Spitzer, S.J., a renowned author and scholar of faith, science and philosophy, delivered the Defense of the Faith Forum address, which was followed by a delightful cocktail reception. On Saturday morning, the Apostolic Nuncio of the United States, Archbishop Christophe Pierre, celebrated the Investiture Mass and Ceremony. Here, new members promised to faithfully call on the name of God, always bear witness to the Catholic faith, and lead their lives in accordance with the teachings of the Church. 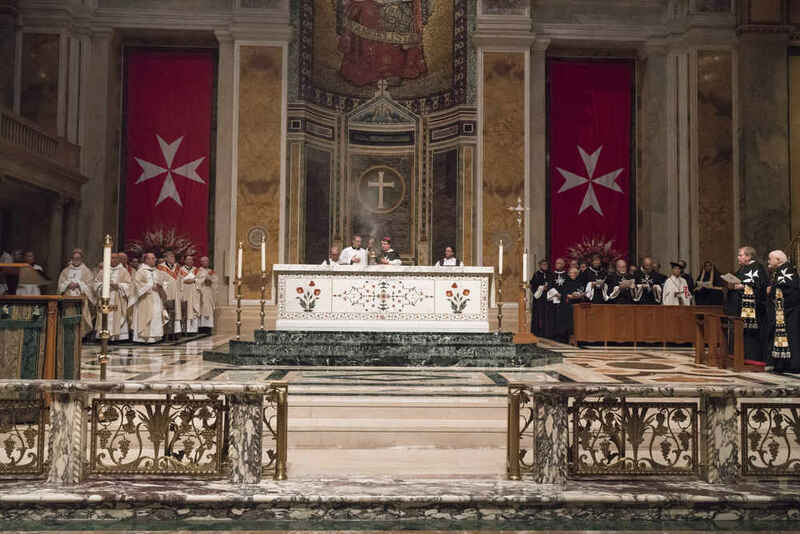 They declared themselves ready to care for our lords the sick and poor, and to obey the constitution of the Order of Malta with fidelity and diligence. The Solemn Liturgy of Investiture was a beautiful and moving event, under the direction of Fra’ Thomas Mulligan, Investiture Mass master of ceremonies and the Rev. Msgr. James D. Watkins, magistral chaplain and ecclesiastical master of ceremonies. Members and their friends and families regrouped for the luncheon back at the Mayflower Hotel. There, the Cross of Grand Officer pro Merito Melitensi was awarded to Gregory J. Granitto, KM, and the pro Merito Melitensi awarded to William Buttarazzi, Jacquelyn S. Gallagher, DMOb, Charles A. Mifsud, II, KM; Frank E. Schmidt, KM, and John P. Shine, Sr., KM. The President’s Awards were given to Margaret P. Sullivan, DM, Barbara Knollmann-Ritschel, DM, Clarion E. Johnson, KM, Daniel V. Young, KM, Cara A. Aghajanian, DM, Andrea Wilkinson, DM, Colleen Akers, DM, and Steven G. Marget, KM, for their contributions and dedication to the Order’s mission and programs. The weekend culminated in the Gala Reception and Annual Dinner Saturday night at the Library of Congress. During the Annual Dinner, on behalf of the Grand Master Fra’ Giacomo Dalla Torre del Tempio di Sanguinetto, H.E. János Count Esterházy de Galántha awarded Margaret Melady with the prestigious Grand Cross of Magistral Grace in recognition of her outstanding service to the Federal Association and the Order of Malta. Throughout the evening, members and their guests recognized the accomplishments from the past year and continued the celebrations in welcoming the class of 2018. The Library of Congress proved to be a spectacular venue for this event, with Hugh Dempsey, KMOb expertly overseeing the dinner committee and details. The Investiture Committee would like to recognize the collaboration and partnership of so many individuals who helped make this weekend a success. A tremendous thank you to all of the volunteers, team members and staff, particularly Madeleine Shakotko, for her flawless preparation and attention to details as program manager; Deacon Michael Stankewicz, for his guidance and input; and Margaret Melady, for her leadership and support. Please note: the 2019 Investiture Weekend is scheduled for September 27-28 in Washington, DC.